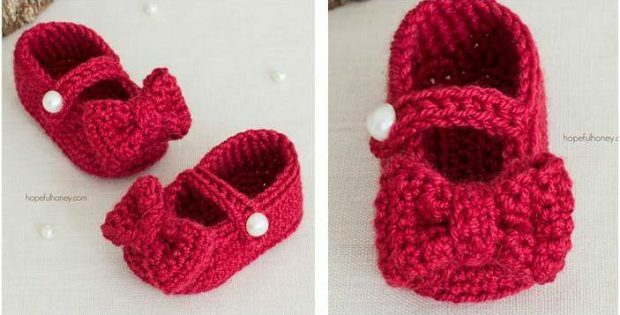 Make these adorable Ruby Red Crocheted Mary Jane Booties for your little lady. The super cute footwear with charming bow detail will definitely go well with any outfit. Craft them in different colors to complement your baby’s wardrobe. In fact, this pattern is a perfect project for experienced beginner crocheters looking to advance their crochet skills. The pattern contains detailed written instructions for different sizes to fit babies ages 0 to 12 months. Also included in the pattern is a photo tutorial that will aid you in making these pretty crochet Mary Jane booties. This crochet pattern is another wonderful design by Olivia Kent. In fact, you can access the FREE downloadable pattern for these cute crocheted baby booties from her website, Hopeful Honey. To access the FREE downloadable pattern for this pair of cute baby footwear, please click on this link: Ruby Red Mary Jane Booties Pattern. Featured image: Hopeful Honey/ Olivia Kent – thank you!